Ketipramine (G-35,259), also known as ketimipramine or ketoimipramine, is a tricyclic antidepressant (TCA) that was tested in clinical trials for the treatment of depression in the 1960s but was never marketed. 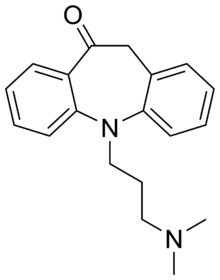 It differs from imipramine in terms of chemical structure only by the addition of a ketone group, to the azepine ring, and is approximately equivalent in effectiveness as an antidepressant in comparison. ↑ Simeon J, Fuchs M, Nikolovski O, Bucci L (1970). "Ketipramine in the therapy of depression in outpatients". Psychosomatics. 11 (4): 342–6. doi:10.1016/S0033-3182(70)71634-4. PMID 5459338. ↑ Park S, Glick B, Floyd A, Gershon S (May 1971). "Ketipramine fumarate as compared to imipramine in depressed outpatients". Current Therapeutic Research, Clinical and Experimental. 13 (5): 322–5. PMID 4998396. ↑ Author Unknown (1971). Ann Reports Medicinal Chem V6 (v. 6). Boston: Academic Press. ISBN 0-12-040506-7.